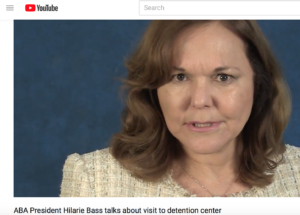 ABA President Hilarie Bass posted a short video asking America’s lawyers to help reunite immigrant families at the border reported the ABA Journal earlier this summer. The American Bar Association Journal is promoting a web page that helps lawyers to volunteer, donate or advocate for detained and separated immigrant families. The web page, http://ambar.org/ immigrationjustice, was promoted by ABA President Hilarie Bass, who posted a video “asking America’s lawyers to help reunite immigrant families at the border,” the ABA Journal reported this summer. “In the video, Bass talks about what she saw during her late June trip to south Texas, where she met with immigrant mothers detained at the Port Isabel Detention Center near Harlingen. Some of those women hadn’t seen their children in six weeks, Bass said; some had talked to their children on the phone, but knew the children were far away,” the ABA Journal reported.